A text on some of the history of class conflict in Oxford, concentrating on the Blackbird Leys riots of the early 90s, and written shortly afterwards. At its very outset Oxford University was established to tie together the hegemony that would run dear old Albion for ever more. In Oxford science, religion and the aristocracy pooled their resources to deepen, mystify and finance their power. The presence of the working class in Oxford was permitted essentially only in order to facilitate all this cerebral masturbation. Some weeks ago the world was surprised to discover that Oxford had a working class, council estates, no-go areas and joy riders. 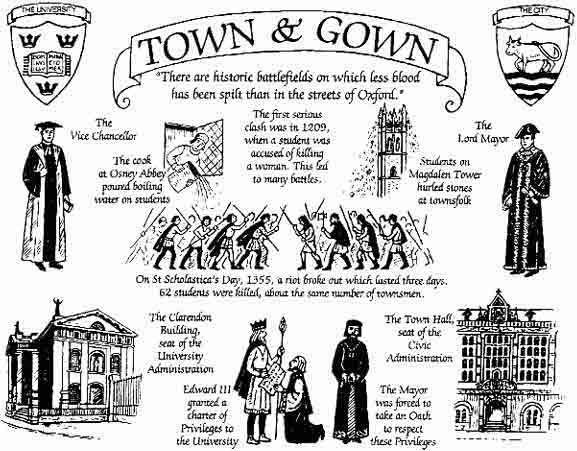 The City of Dreaming Spires that had supplied the world’s establishment with tyrants, fascists, Marxist/Leninists and an intellectualised bourgeoisie has been a facade for a class war that has been waged for hundreds of years in and around Oxford. Bit over the top? Exaggeration? Let FiFi La Rue (an Oxford Resident for many years) guide you through the darker side of Oxford’s past and present. endangeredphoenix footnote 1: In the aftermath of Poll Tax, anarchists tended to think they were a special case. This is the only really bad sentence in this text.